Although eggs are associated with the Christian festival of the Resurrection, the association of eggs with Spring (and fertility) is much older. The practice of painting eggs goes back millennia, with Sumerians and Egyptians doing it 5,000 years ago. There’s even a decorated ostrich egg that’s 60,000 years old! The early Christians painted their eggs red to symbolize the blood of Christ, although any bright colours are used today. My childhood never featured egg hunts, though we did roll painted hard-boiled eggs down grassy slopes. 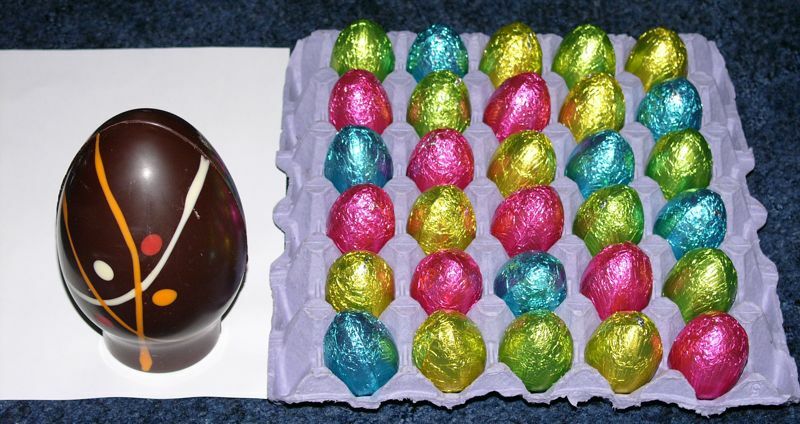 The eggs are often of chocolate today, representing an Easter feast as the Lenten fast ends. The small eggs in my photograph were there for young nephews and nieces who came visiting over Easter. They were hollow ones made of milk chocolate. The large egg was there to be shared by grown-ups, whose more sophisticated tastes like dark chocolate rather more than children usually do. Happy Easter!